The facility upgrade is helping lower collection costs for several communities while increasing recycling rates. Intergovernmental cooperation and partnership with the private sector have been essential to the Resource Recovery and Recycling Authority of Southwest Oakland County's (RRRASOC) operations. Formed 25 years ago by a group of Michigan communities, it has partnered with the private sector for most of that time. 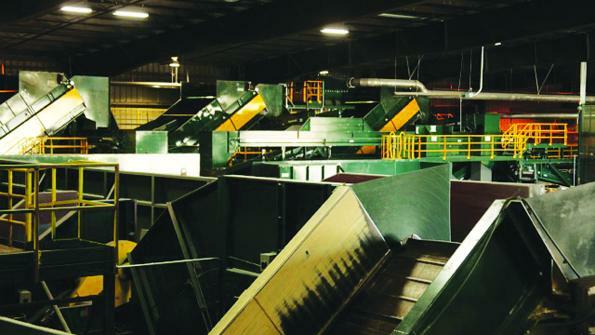 Most recently, Charlotte, N.C.-based ReCommunity Recycling — the facility's private operator — invested approximately $4.5 million in a materials recovery facility (MRF) to convert it to a single-stream processing facility capable of handling mixed recyclable material. Its goal was to increase the MRF's capacity in the types and volume of material that it could process. The facility processes recyclable material collected through RRRASOC's municipal curbside and drop-off programs, as well as additional commercial and residential material secured by ReCommunity. The new layout allows for a single material tip floor and system infeed, as opposed to the dual stream system that required two tip floors. The new additions include multi-dimensional screening equipment designed to separate paper materials from glass, plastic and metal, optical sorting equipment for plastic, an eddy current for aluminum, and several quality control points at which employees can manually monitor product quality. The new equipment, manufactured by Bulk Handling Systems of Eugene, Ore., became fully operational in January 2012. The project has increased facility throughput and efficiencies. The MRF now has a capacity of 25 tons per hour and processed 59,852 tons in 2012 compared to 10,400 in 2011. Employment at the MRF has increased from 15 employees in 2011 to 66 employees at the end of 2012. The shift to single stream has allowed the deployment of large recycling carts to replace the smaller bins. The communities that made the change experienced a 4 percent decrease in collection costs and an average 60 percent increase in the amount of recycled material collected.